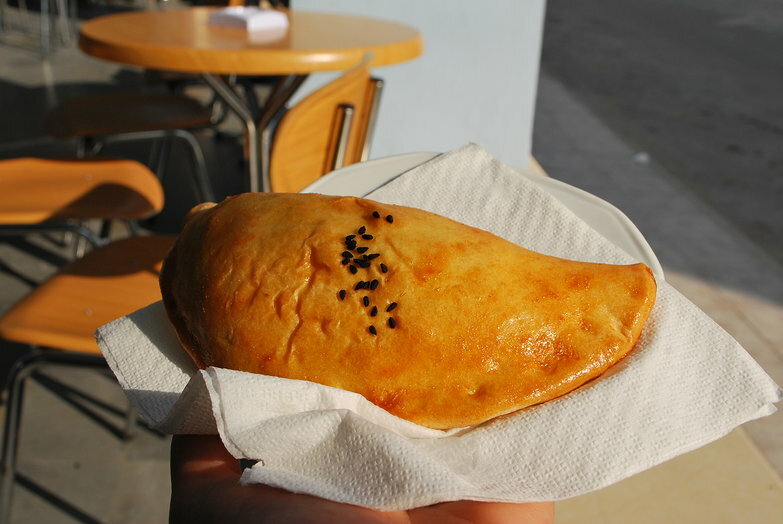 Eating well in Tunisia is proving to be a bit of a challenge. Our normal process of buying groceries and cooking our own meals just doesn't seem to be applicable here. Also, the sun starts setting around 5PM now, usually forcing us to cook in total darkness (with the help of our headlamps). This is not something we enjoy very much. Luckily, eating out is not a problem and is often more affordable than buying groceries. Cheap restaurants seem to outnumber the appealing things to buy in the supermarket anyway! We thought we'd be eating a lot of couscous but we've come to find it is much rarer than one would think. 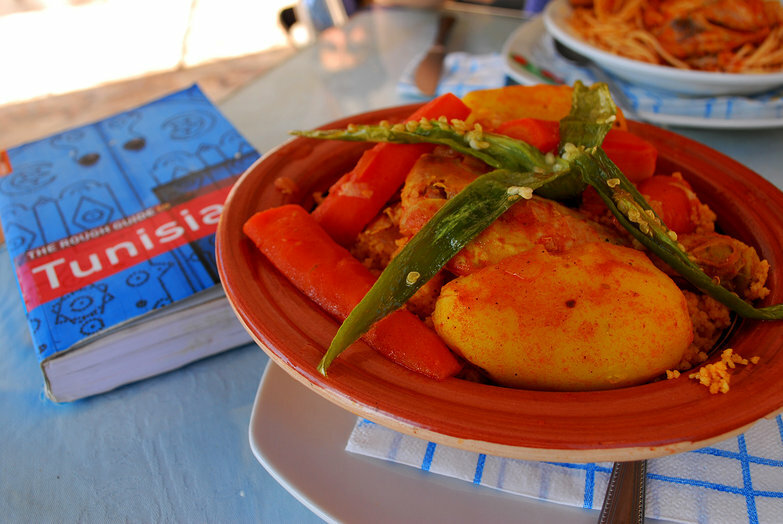 Tunisians may cook it in their homes but we haven't found it in many of the restaurants we've frequented. 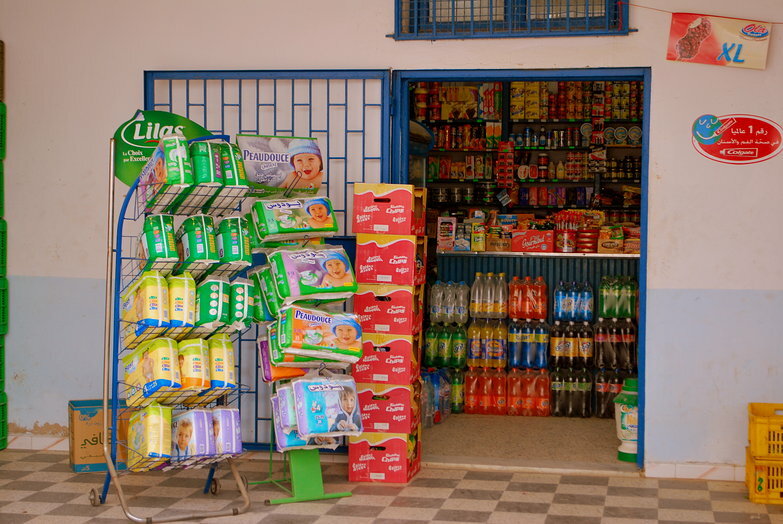 Outside of large cities, supermarkets do not exist. When we do manage to find one it is usually a very small affair of only three or four aisles. Making matters worse: those three or four aisles are usually very sparsely stocked. Having arrived from Italy this has been a big transition for us. One curious detail: cheese doesn't seem to exist here. I did manage to find these little sticks billed as "Cheddar" though. They taste like Velveeta. 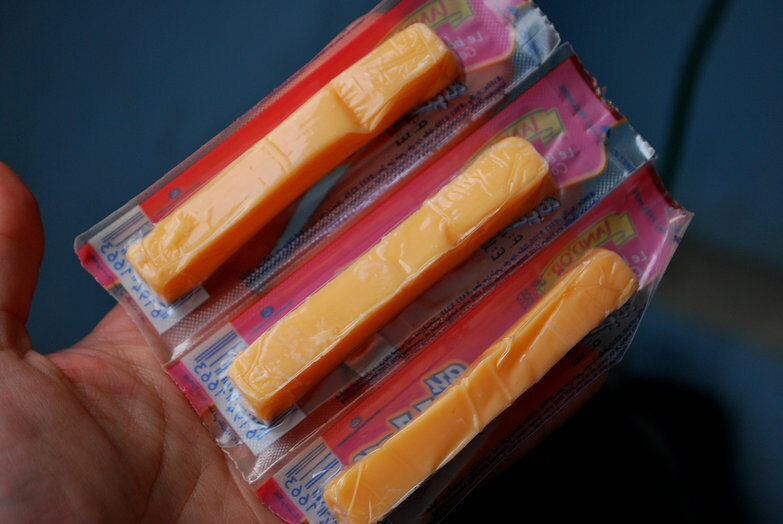 Deli style meats come in tubes, molded into a squishy substance that doesn't really resemble meat at all. Loaves of sliced bread don't exist and the baguettes that are available everywhere have a strange consistency, almost as if they were toy food made of foam. Thankfully not all of the food groups have been ignored! There are an abundance of fruit and vegetable stands everywhere. 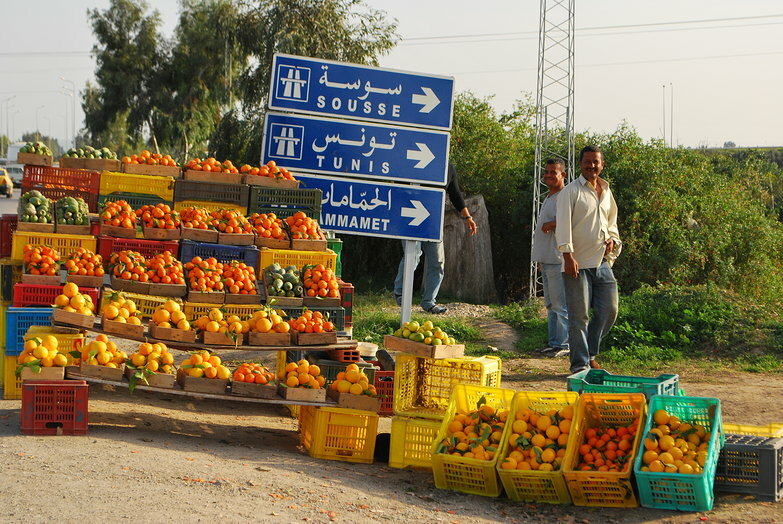 We regularly pick up giant bags of delicious oranges for about 1.500 dinar. We've been eating a lot of fruit. Costing surprisingly LESS than their grocery-equivalent is eating out at "Fast Food" places. 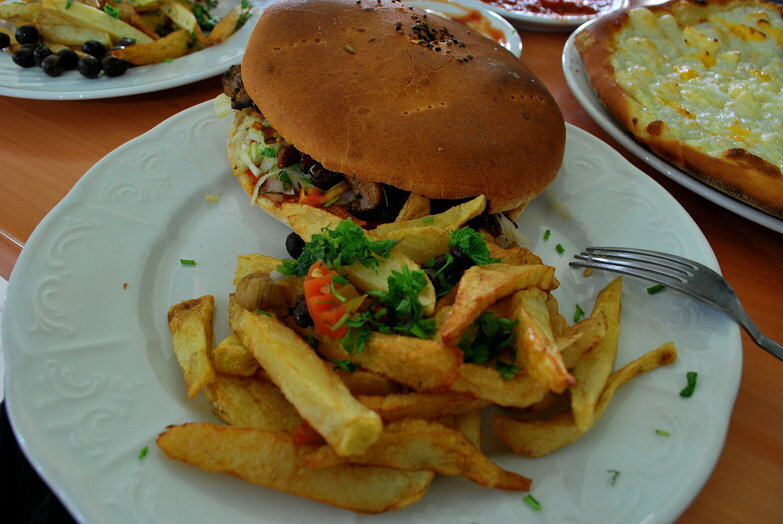 "Fast Food" here means a variety of sandwiches, generally consisting of a flat, round bun stuffed with spicy meat and crunchy vegetables. 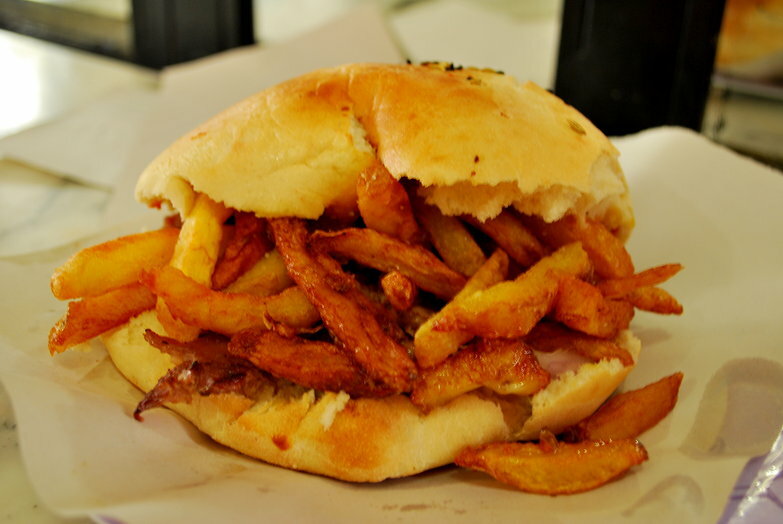 Our favorite Chawarma sandwich is gigantic and can tide us over for most of the day for the low price of 2 or 3 dinar. They always come with fries either on the side, or stuffed in the sandwich. Though delicious, we're growing tired of them. 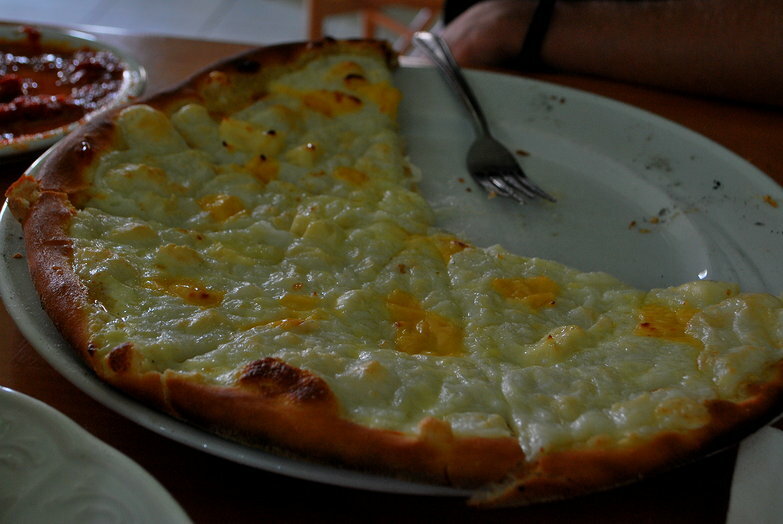 Also found at fast-food places are delicious wood-fired pizzas; they roll out the dough, assemble it, and slide it in the fiery oven right in front of you. There is a high risk of tuna being added to everything, though, so we always make sure we specify NO TUNA on any orders that might be questionable. "Chapatis" though, are the main vehicle for the strange-at-first ingredient combo. They are grilled so that processed "American"-style slices of cheese melt over the tuna, olives, harissa, egg, and potato that fill the sandwich. It is a slightly strange combination at first, but it kind of grows on you. Sort of. Unfortunately it also creates "the worst breath ever known to man" (according to Tyler) which cannot be saved, even with repeated tooth-brushing. 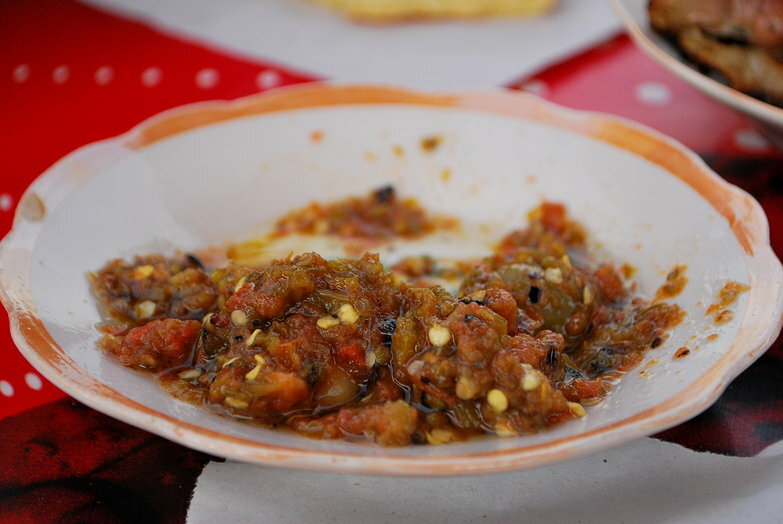 More expensive than fast food are the many grillade places that dot the highway. Basically, these establishments are glorified butcher's shops that cook the meat for you. 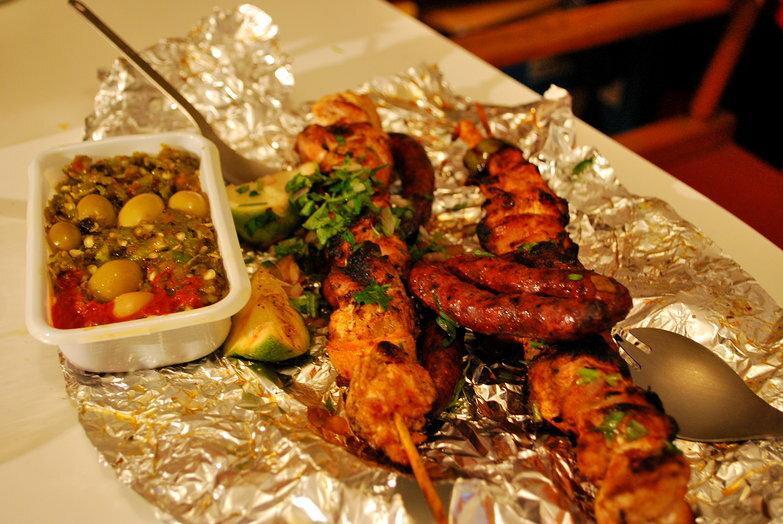 You choose from lamb chops to chicken skewers to merguez sausages, and they throw it on a huge grill. Ten minutes later, they bring you the meat on a plate served with a lime wedge and probably some salade mechouia, a few olives, and a dish of harissa. Delicious flat-bread generally comes with the meal as well. 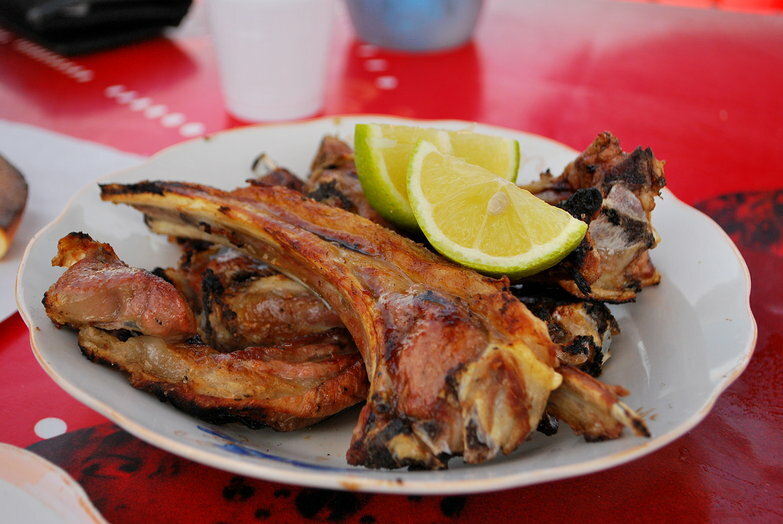 Grillade restaurants are good for a treat, but they're more time consuming and expensive than we usually spring for—a small meal of lamb (which could have been for one person only, but we shared it) including salad fixings cost us 8 dinar. Still not a lot, but we're on a budget. Besides our large midday meal, we eat light breakfasts and dinners. 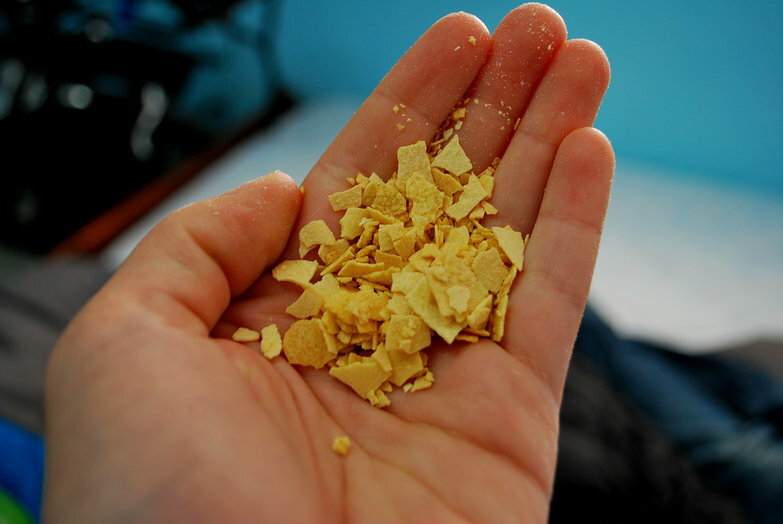 For breakfast we eat cereal, or a pack of the dry cookies that are sold everywhere here. Milk is all ultra-pasteurized and comes in thin cardboard boxes, just like it does in France. Except that here it is impossible to find any cold or unpasteurized milk at all. 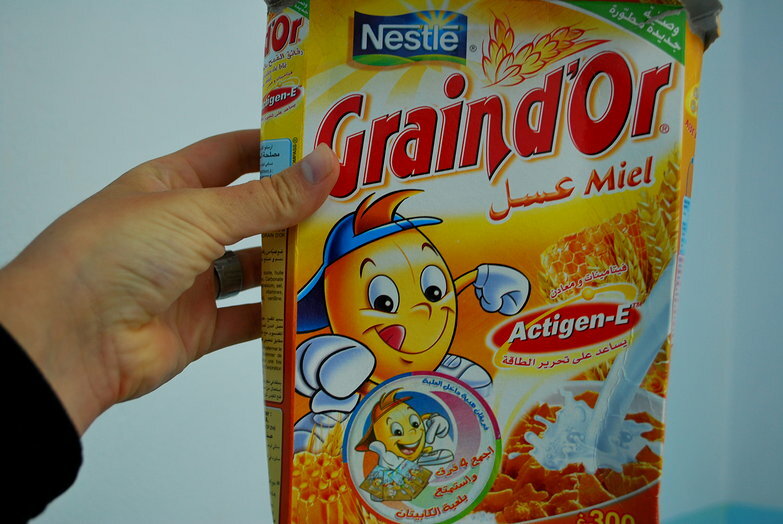 There are two main choices for cereal in Tunisia, the most popular of which looks like someone took a huge flat cracker and broke it up into shards. The other is like a large, foamy puffy version of Honey Nut Cheerios. Sometimes other kinds are available at the elusive supermarkets. Here on Kerkennah, the coffee-shop in Remla makes my favorite breakfast of all. 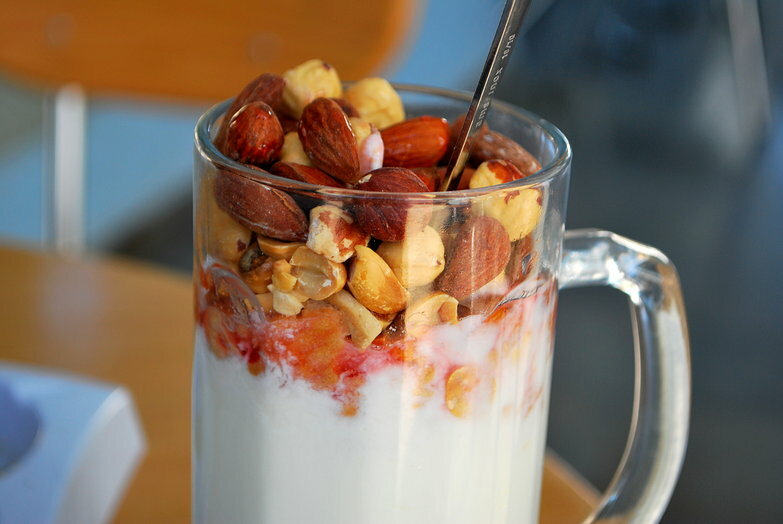 It's yogurt (homemade here at the cafe) with pomegranate syrup drizzled over and roasted nuts stacked on top. It's called "Jwajem" and you mix it all up for a nutty, flavored-yogurt concoction. SO good! Our big sandwiches and pizza last us for quite some time, but when we're ready for dinner we usually just spring for some sort of snack. If we're feeling ambitious or if we're camping, we fire up the stove and cook something. Generally this is a sad process because we don't cook every day any longer; we often find that our onions have rotted, the garlic is bad, or the potatoes have sprouted. I feel confident we'll get our act together cooking-wise, but for the moment, its nice to enjoy every precious minute of daylight without feeling rushed to get something prepared before its dark. 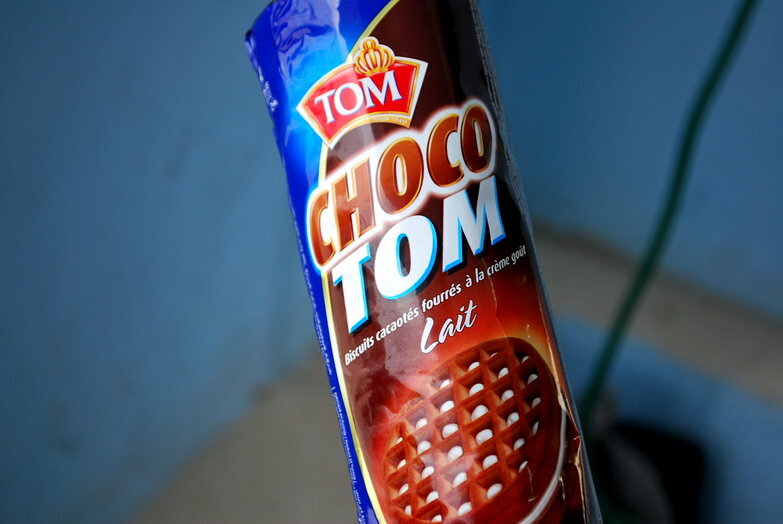 All in all though, Tunisia is a bit of a culinary disappointment! Thanks for the correction and translation Houssem. We tried really hard to find the right name for that. We've updated the entry!